Excerpt from U.S. Coast Guard “Proceedings of the Marine Safety & Security Council” magazine, by Mr. Stephan Brabeck, technical director, SkySails, GmbH & Co. KG. In today’s environment, ship operating costs are skyrocketing, mainly due to rising oil prices and new international regulations for the reduction of ship emissions. In order to remain competitive, many shipping companies are looking for ways to minimize fuel consumption and emissions. One idea: Use wind power. 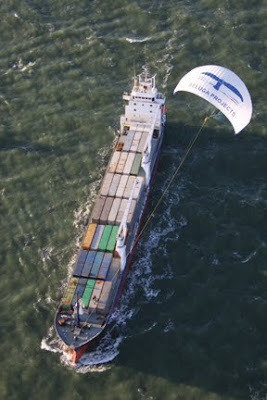 Two shipping companies, Beluga Shipping and Wessels Reederei GmbH & Co. KG, are testing one method using a large towing kite shaped like a paraglider to aid the propulsion of the vessel. The tethered, flying towing kites are designed to operate at altitudes between 100 and 300 meters, where stronger and more stable winds typically prevail. The Wessels vessel Michael A has been retrofitted with this system. MS Beluga SkySails hosts the first installation on a new build. Taking advantage of the dynamic flight maneuvers this system is potentially capable of (such as figure-eights) could generate more power per square meter of sail area than conventional sails. It may be possible, then, to gain significant savings by using comparatively small sail areas. System components are being long-term tested, and the results are continually used to improve and optimize the product. Research and development work will focus on advancing the technology and increasing its performance. Early results indicate that while virtually all seagoing cargo vessels should be able to be retro- or outfitted with this propulsion, it is best suited for cargo ships with an average cruising speed of under 18 knots, as well as superyachts and fish trawlers of more than 24 meters. Full article and “Environmental Protection” edition of USCG Proceedings is available at http://www.uscg.mil/proceedings/Winter2008-09/.